This vase is approximately 236 mm (9 5/16ths inches) tall. 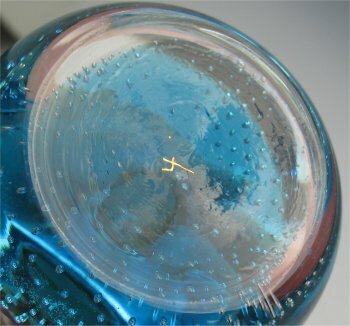 The base is turquoise blue, a flattened ball shape and has small well controlled bubbles coming up in a spiral. The bottom of the base has a small depression and a probable decorators mark in gold (see image below). The stem is slightly bulbous and is approximately 32mm (1 1/4inches) across the top. 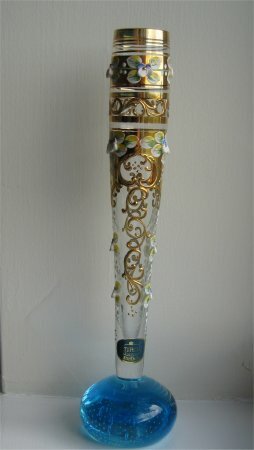 It is highly decorated with raised enamel, gold, and flowers (pansies). 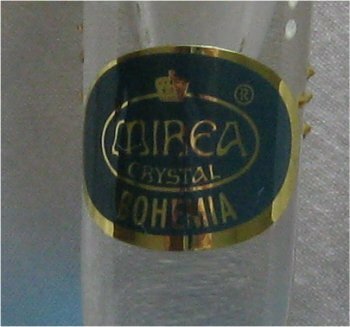 The pansies have a slightly rough feel compared to the rest of the decoration and stand out much more The label is oval, has a metalic blue background, with a gold border,crown,and writing, stating "MIREA CRYSTAL BOHEMIA" (see image below).